Abraxas is the name given by some of the early Gnostic Christians to denote the embodied form of God. In the language of the Gnosticism, God in the true sense is called the 'Pleroma', which means fullness. So Pleroma would correspond with Brahman in Hinduism, Ein Sof in Jewish Kabbalah and the Tao of Taoism etc. All these terms are referring to God in the unknowable sense, the God is beyond concept and beyond imagining. The God that is the source of all being and the ground of all existence, so God in the true meaning of the word. Now, if God were to manifest in the temporal realm then we will have something that we can conceptualize and label. For the Gnostics the label for this phenomenon was Abraxas. The origins of the God Abraxas are mysterious though it is believed the concept existed in ancient Egypt. It is thought that Abraxas was then adopted by Jewish mystics and then later by the Gnostic Christians. So Abraxas has a long history in the esoteric circles of the Mediterranean and near East. Abraxas is a conception of God that incorporates both Good and Evil in one entity. So in Gnostic terms he is both God and Demiurge. He represents a mono-theistic God but at the same time he is quite different from the omni-benevolent God found in later Christianity. In his depiction he has a Roosters head, a mans torso and two snakes for legs. Also he is often shown carrying a shield and a whip. The shield represents protective wisdom and the whip driving power. The roosters head symbolizes wakeful vigilance and the announcement of a new dawn. The snakes may be considered symbolic of the Goddess, it is an animal closely associated with Isis and Demeter, two important conceptions of the Goddess in antiquity. Also the snake in India represents the Shakti or female energy which is thought of as a sleeping serpent lying dormant within all of us. In this way Abraxas would truly be a juxtaposition of the fundamental polar opposites of Female and Male and as described earlier the combining of Good and Evil. The image of Abraxas was often used to decorate good luck charms, seals and amulets in antiquity. These ancient Abraxas artifacts were quite common and many still exist today in museums and private collections. 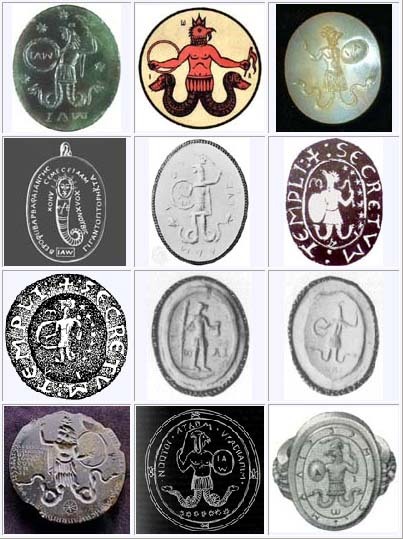 Later on in history, the order of the Knights Templar put the image of Abraxas on their most important seals which was used to bind the most secret documents. Here are a selection of Abraxas Gems, amulets and seals. In most cases we find the classic depiction of Abraxas, with a roosters head, man's torso and snakes for legs. Also of note is that in almost all these examples, we can see the three letters 'I', 'A' and 'W' spelt out either as a word i.e. IAW and WAI, or else positioned separately on the shield carried by Abraxas and also more widely around the figure. One of the reasons for the juxtaposition of these three letters derives from an ancient Jewish/Egyption God name 'IAO', which is pronounced 'iaho'. The common expression for God, 'Jah' is thought to derive from IAO. The variant of IAO, i.e. IAW also has another meaning. The greek letters, 'I' Iota, 'A' Alpha and 'W' Omega, can be interpreted as 'I am the Alpha and the Omega' or another way of saying GOD. In modern times the concept and name of Abraxas will come up from time to time. In an indirect manner, the word 'abracadabra' is believed to derive from the Abraxas. In the world of psycho-analysis the renowned Carl Gustav Jung showed an interest in Abraxas and wrote a work called 'The seven sermons of the dead', and attributed it to an ancient Gnostic sage called Basilides of Alexandria, who was a strong proponent of Abraxas. The Nobel prize winning novelist Herman Hesse uses Abraxas in his novel Demian, which explores the themes of good and evil. And the popular jazz guitarist Carlos Santana called an album Abraxas in the 70s. Last but not least, Abraxas is believed by some to be one of the many God names of Freemasonry, that are slowly introduced to higher grade Freemasons as they progress up the ranks and hidden grades of the secret society. It is believed that at the heart of Freemasonry is a conception of God which encompasses Good and Evil. On one level Freemasons refer to God as GOATU or the Grand Architect of the Universe. On a deeper level another Masonic epithet for God is Jahbulon, which is a word drived from the God names 'Jah', 'Baal' and 'Osiris'. Jahbulon is thought to represent a divine amalgam of light and dark in a way not so dissimilar from the idea of Abraxas. So Abraxas is a historical relic, good luck charm, cultural symbol and an interesting conception of God. If the true and genuine spiritual revival of present times can be seen as a return to Gnosticism and Pagan ideas, then perhaps Abraxas can provide us with a definition of God for the future. It will be as if Abraxas far from being a forgotten idea of the past was really a powerful and correct interpretation of God, waiting for the right moment to emerge and become more widely known again.